Although not too many people up in my neck of the woods shared my interests, I did have a lot of friends at Ramapo High School. 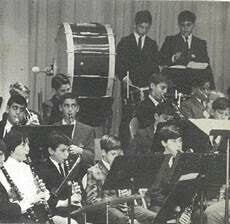 The school had a tremendous arts program, and got into NYC’s St. Patrick’s Day parade in 1970 and 1971. We have never since done that. It’s very difficult for a marching band to get into that parade–synchronizing 180 people in an orchestra, when people are smoking pot and doing LSD–it’s not easy to keep that together! Where did the “Stu Boy” nickname come from? How did you get involved with the Dictators? One of the guys I knew in high school, Bob Kaplan, who was a little older than me, was friends with Andy Shernoff. This goes back to 1971 or 1972. Bob was living up in Rockland County, but he came from Queens, and he knew Andy before he moved up here. Andy was going to SUNY New Paltz, and Bob would go and hang out up in the dorms at New Paltz. Andy wasn’t a musician at that point. All of us went to a little club where the college kids would go listen to music and drink beer, and we would watch a band called Total Crudd, who had a roaring monster of a guitar player named Ross [“The Boss” Friedman/Funichello]. Through Bob, I became friends with Andy and with Ross before there was a Dictators, before those two even got together! Ross was a wicked player, even at a very early age! He was LOUD, FURIOUS, and certainly turned up the decibels. I knew I wanted to jam with that guy. I remember this one song called “My Coca Cola Can,” so already he had the signs of a punk, even though that word wasn’t being used at that time. He was grinding out that kind of sound long before the Dictators. A lot of people were emulating Clapton, or Page, or Jeff Beck–not Ross. He had his own sound already. A little bit later in 1972, after high school graduation, at 18 years old, I went to England, because I wanted to see the English bands play, and learn to play in their style. I’d go through Melody Maker’s ads, knock on doors and audition for bands. I got to speak with Stan Polley, who was president of American International Management, and he got me in contact with Badfinger! They had interest in using me, but the concerns were that I was too young, and that I was on a passport–how long could I stay? I practiced with them a few times and ended up living in their practice studio in London. The band was very nice to me, and they used to torture their drummer every time his wife caused trouble by telling him, “If you can’t go and play with us, we’re putting Stu in!” Meeting the band did lead to me getting my first studio session ever, for EMI, a song called “My People in The Village” by Al Turner. It was a reggae song and was very popular in Europe. I also got to play a huge gig with two members of Elephant’s Memory at the Marquee in London, in maybe November or December of 1972, opening for Chris Spedding’s band Sharks. I don’t remember what we were called. The whole UK experience was euphoria for me. But a few weeks before I went, in July or August of 1972, I spoke with Andy, and he told me he was starting a band with Ross. They were still up in Kerhonkson, and they wanted me to be in the band. Period! The Dictators were starting before I even went to England in 1972! I remember that I had all my drums in my car with Andy, and we were driving up to the house they shared to jam together. It was nighttime, we were in the middle of nowhere, and he couldn’t find the house! I was planning on staying up there and playing with them, to see if it was going to work out. We tried playing, and we couldn’t get it together. There was a lot of frustration over it. 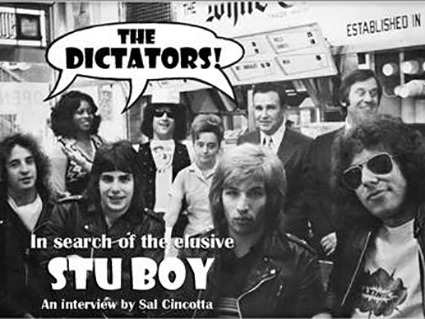 The Dictators, at that point, were more than a clique than a band. You have to remember, Andy and Scott Kempner hadn’t played their instruments for very long. Musically, things were just not working out. So I went to England and never got to play with the beginnings of the Dictators. I might have changed my trip completely, if I’d known that, lurking in the background, were Murray Krugman and Sandy Pearlman [managers and producers of Blue Oyster Cult]. It might have changed the whole interpretation of the foundation of the band to begin with by having me in the band. It might have changed the creative part of it as well. When I came back to the States, I played with some of my mentors in the Silver Caboose for a while. They were a tremendous band, with great vocals and musicianship. They did an album under the name Anthem on Buddah [in 1970], on which they changed their sound to try to be a Chicago-type band, and it just didn’t work out. I just loved playing with them, but there was an eight-year age difference between me and them. I was hungry to go to the city and become successful. These guys, they didn’t share my ambition. They had already been there and back, done TV shows, put records out, and had no desire to try again for the big stage. They were making good money doing what they were doing. But I wanted to move forward, so I took my EMI tape and started going to the city. I loaned that tape to one of the members of the Tokens, who said he’d use it to try to get me work, and never saw it again. I was playing a lot at that point, and I got into another band called the Virgin Woolies. Good-looking guys, Stonesy type of sound, original music. We played a lot at an all-girls college, Marymount College in Tarrytown. Not a bad gig when you’re 19 years old! We had a great audience of all Catholic schoolgirls. But they didn’t want me to play any rolls. They were holding me back, and I was a little young to be held back. Then the Dictators came calling again for a drummer.